Sunday 1st November – special united service at Rutherglen URC at 11:00 followed by soup lunch. Joint service for Hamilton, 2 East Kilbride churches and Rutherglen to explore further concept of ‘cluster churches’. Contact Douglas for travel details. The Church held the annual harvest Service on 4th October. 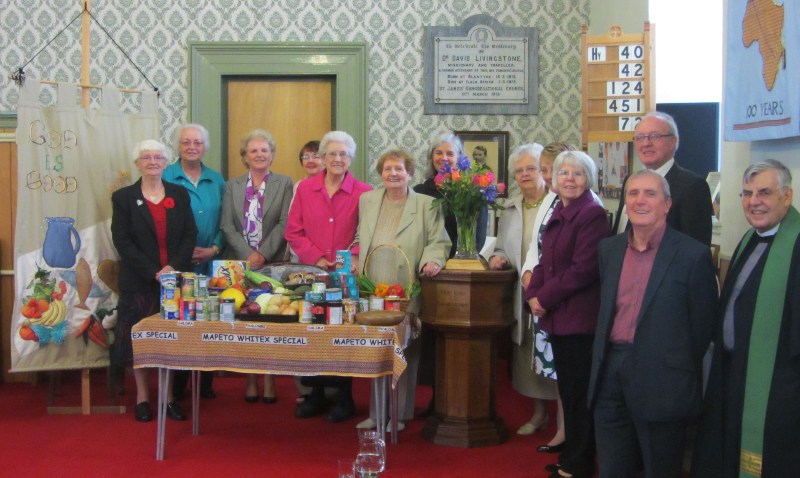 The goods donated were given to the local Food bank, and there was a retiral offering which was donated to the local Church’s Drop-In Centre. The guest preacher for the Service was the Rev’d. Gordon Smith, a former minister of the congregation. The Lanarkshire Walk a Mile event will take place on 23rd September at 3.30pm at Strathclyde Park, Motherwell. We will be joined by Chris McCullough Young, who has been walking around the edge of the UK with no money, to tackle stigma one conversation at a time. Young woman who had been in care for 17 years now works as an ambassador for ‘Who cares Scotland’ delivers a talk to the Scottish School Teacher’s Association conference. The PowerPoint Presentation link is at the top of here blog post. There will be a Daffodil tea in the Church halls on Thursday 26th March 2015 – starting at 7:00 until around 8:15ish. We think we have resolved the problems with the site menu system. However, some link between pages might have been broken. If you come across any such, please let us know via the contact form – which page you were on when you found a broken link – and we will fix is ASAP. Something had gone wrong with the menu bar at the top of the site. Thought I knew how to fix it – but it doesn’t want to be fixed. Hope to find a solution over the next couple of days.